If we try to prove to God how much we love Him, it is a sure sign that we really don’t love Him. The evidence of our love for Him is the absolute spontaneity of our love, which flows naturally from His nature within us. And when we look back, we will not be able to determine why we did certain things, but we can know that we did them according to the spontaneous nature of His love in us. The leader must first and foremost be a lover. This is where we err. We can become fixated on doing things right and forget that we need to primarily love right. Leaders are not meant to just be managers but lovers of God and lovers of people. This love supernaturally overflows from God down to us and then out of us onto others. God doesn’t want robots. He doesn’t want rote answers or prayers. He wants love songs. He wants smiles and hugs. He wants our affection and hearts in passionate display. This is love, right? It cannot be prescribed or formulaic; it can only be natural. So love God in ways that are natural for you. Let your love for God flow from your heart of praise for Who He is and what you understand about Him. The leader must daily be swept up in God’s love. When we fail to love people we become a taskmaster, simply using people or moving people. But when we love people, the people move of their own accord because of the power of love. Being caught up in that forceful flow, people follow the leader whose love is genuine and real. A leader can only love this way when they have experienced the love of God themselves. People don’t want fake sentiments of love. They don’t want our platitudes. They want our hearts; hearts of compassion and sincerity. They want smiles and hugs. They want to know our love is genuine but it can only remain genuine when our hearts for God are genuine. We are unable to love with the love of God if God is not our first love. 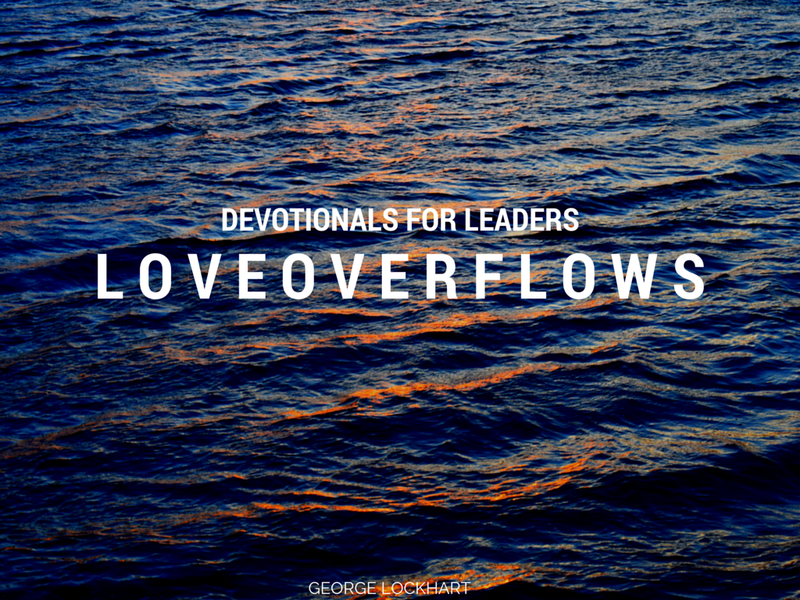 Love for others only overflows when we are overtaken by His love for us and them. God loves people more than we can imagine and as His leaders, He wants us to love them well also. We will love them well when we serve them well. Don’t focus on being right. Focus on loving them right. Final thought: Remember that loving God and people is our primary goal as a leader. If we don’t love right we will not lead right. So let the love overflow. Next Next post: Devotionals For Leaders: god of feelings. God Of Faith.